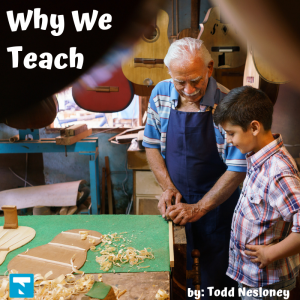 Why do you teach? Why did you want to work in education? Or something else along those lines…. But what if your answer is none of those? What is the answer is something more along the lines of “I need a paycheck” or “It keeps me busy”. That’s when we really need to address our priorities. The moment working in education becomes only a paycheck or something to keep us busy is the moment we need to look elsewhere. Why? Because there are MANY jobs to keep food on the table and take up your time. But when we work with children, we’re impacting little lives, that will be felt for years to come. And that is far too important of a task to take lightly. Our children watch our every action, our every word, and our every interaction with others. We have to be careful about who we are choosing to be in front of our children. We have to find ways to become more patient. Find ways to bring more joy into our day. Find ways to entice, excite, and engage our kiddos. Like any career choice with qualified individuals, we have to daily study our craft and find ways to get better. We have to complain less and look for solutions more. No where we work is going to be perfect or filled with perfect co-workers. But you know what we CAN do? What we DO have control over? It’s…..US. We can control what we choose to put our emotional energy into and how we choose to come at each situation. So this week I challenge you to find the little things to bring joy back into your life. To find ways to laugh with your students. To study a part of your craft that is lacking and celebrate your work at trying to improve that area. To see struggles as opportunities to be better, for the kids. To complain less, and look for solutions more. Our kids need us! WE are the ones charged with getting them to where they need to be! Let’s do this!